Saw this poll in Parade magazine today and thought that I might ask you the same question. I love the "God shed his grace on thee" refrain in that song but think that the current anthem should be retained. What do you think? Should we replace The Star Spangled Banner with America the Beautiful as our anthem? Nothing against "America the Beautiful," but I think we should stick with "The Star Spangled Banner." Just a thought, but perhaps it would take less effort to educate the public about the history of our current anthem than to change it. More Americans might appreciate it if they better understood the story and meaning of it. I think I would stick with "The Star Spangled Banner". I feel it presents a more realistic and less utopian picture and I appreciate it for that. My vote is with "America the Beautiful". 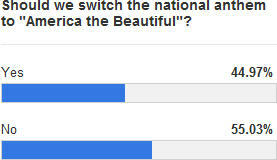 I really like the words to both songs, but "America the Beautiful" stands out more to me. I'm a traditionalist, so I would vote for sticking with the current anthem.